4x4 gets you going great, stopping can be an issue on ice and snow. My Dodge RAM 1500 has been very reliable, I bought it in 2002 with 60k miles. I have driven it on many military backfill deployments. It now has over 180k miles. I have never needs any major repair, I do my own repairs, brakes, coolant, fluid levels and changes-oil, transmission filter and fluid, transfer case and differentials. 4x4 works great, needs a times here in nd/MN. Extended cab has lots of room for passengers and some storage back seat. My only complaint (other than mpg) is RAM rust, very typical on rear wheel fenders, wells, and side panel bottoms. This truck had several features for it is time. Lots of torque and pulling power, 5. 2l engine. Dodge pickups are well built and can last forever with minimal repairs. My vehicle is a 2001 Dodge Ram 1500 extra cab pickup truck. It has a standard transmission, gets good gas mileage for its size, and had zero issues until it passed 200,000 miles. Since that point, I have had a couple of pretty big issues. Last summer I had to replace the axle and shortly after I had to replace the clutch. Currently it is having O2 sensor issues and the radiator needs flushed with a possible thermostat replacement. But really, for having made it over 200k before issues arose is pretty amazing. I purchased it used in 2009 and it is banged and bruised, I've replaced a million tires it seems but still it keeps on trucking! Paid for! No monthly payments. And I really like about my truck the most is that it is paid for. It suits my needs being a truck. I am comfortable with the way it handles. I just wish it got better gas mileage. Not having to make monthly payments, at this stage in my life, is a luxury. For me it is much less expensive to pay for a repair didn't go out and buy a new vehicle. Where the brand new or previously out not having to make monthly payments, at this stage in my life, is a luxury. For me it is much less expensive to pay for a repair didn't go out and buy a new vehicle. Whether is the brand new or previously owned. Raving Reviewer: Known problems of the 94-01 Dodge Ram. 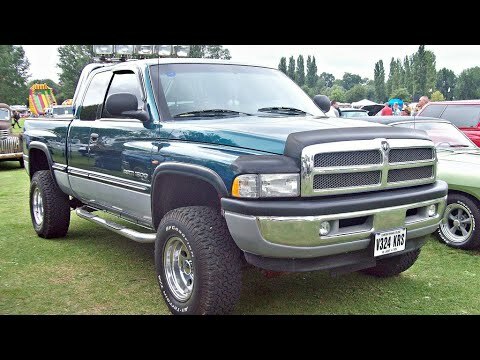 Dodge ram second gen review. On certain Quad Cab pickup trucks equipped with a camper package and overload springs, the spacer plate could lead to deformation of the upper spring plate during assembly of the axle to the vehicle, resulting in a soft joint. The soft joint could cause the rear axle U-bolts to lose clamp load, resulting in displacement of the rear axle and a loss of vehicle control. Dealers will remove the spacer plates and the spring plates will be replaced. The manufacturer has reported that owner notification began Feb.4,2001. Owners who do not receive the free label within a reasonable time should contact DaimlerChrysler at 1-800-853-1403. On certain quad cab pickup trucks, the upper control arms attached with cadmium coated nuts can cause the bolts to stretch due to the application of a higher than specified clamp load. Breakage of the upper control arm fasteners could cause the axle to rotate forward under braking conditions. This rotation could twist the steering linkage and possibly separate the brake lines. Dealers will replace the upper control arm bolts and nuts. Owner notification began Oct. 30, 2000. Owners who do not receive the free remedy within a reasonable time should contact DaimlerChrysler at 1-800-992-1997. On certain pickup trucks, the alternator wire connection to the power distribution center (PDC) can loosen, resulting a vehicle fire. Dealers will inspect the installation of the alternator wire connection to the PDC and, if necessary, reposition the wire so that the crimp connection will face upward and tighten the fastener to the correct torque setting. The manufacturer reported that owner notification was expected to begin during late April or early May 2002. Owners who do not receive the free remedy within a reasonable time should contact DaimlerChrysler at 1-800-853-1403.